I’m in love with seafood and that is no secret. Making this was inspired by making Seafood Okra. 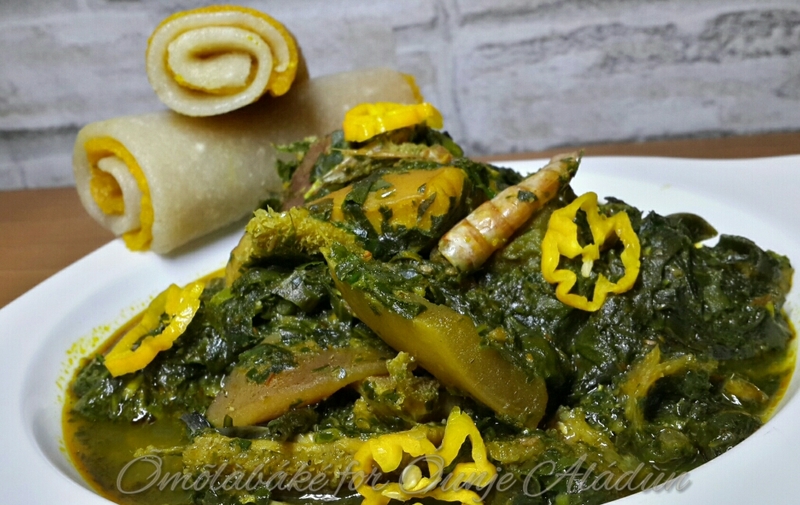 Grind Ogbono Seeds with crayfish. 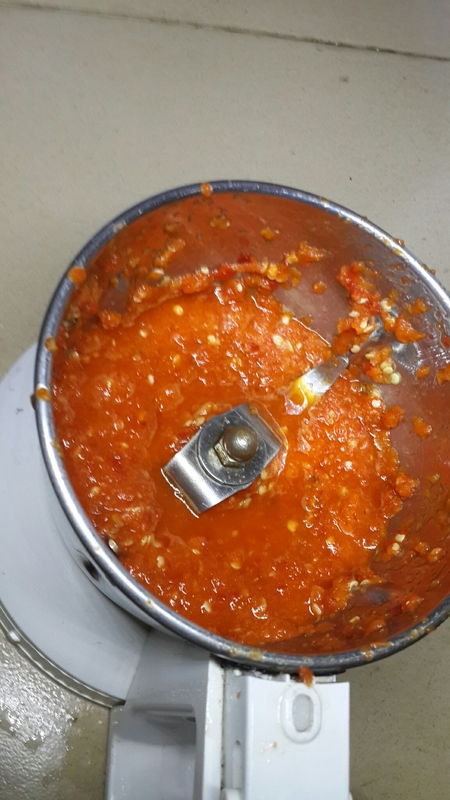 Blend Cameroon pepper and Uziza seeds together. 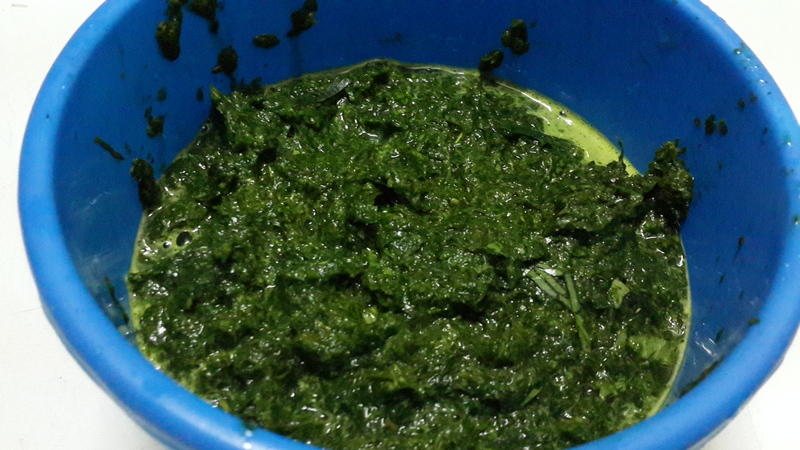 Rinse Uziza and Ugu leaves . 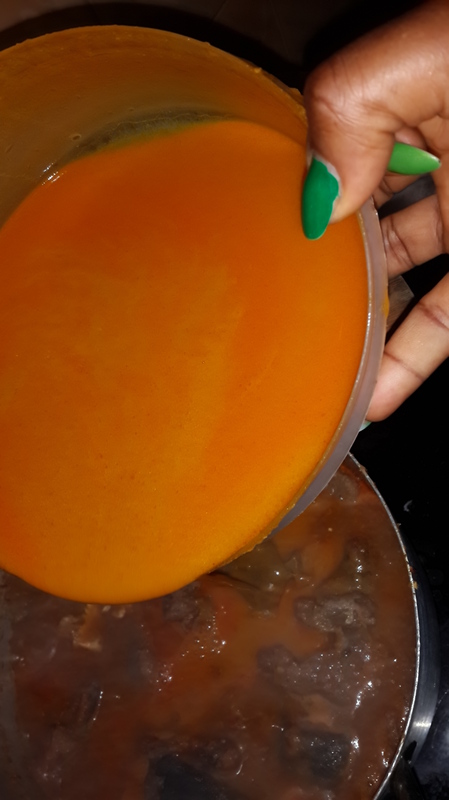 Put a clean dry pot on heat and add palm oil, next add the ground Ogbono and stir till all lumps are dissolved now add your meat stock, if you don’t have meat stock add water. 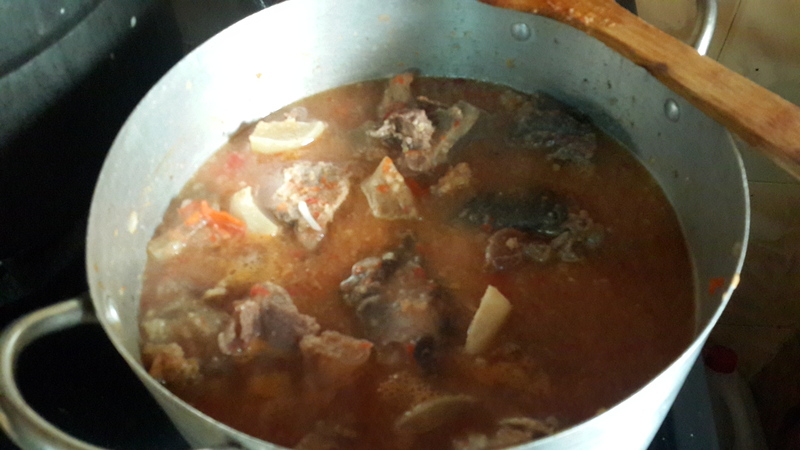 The soup starts to thicken and get stretchy. 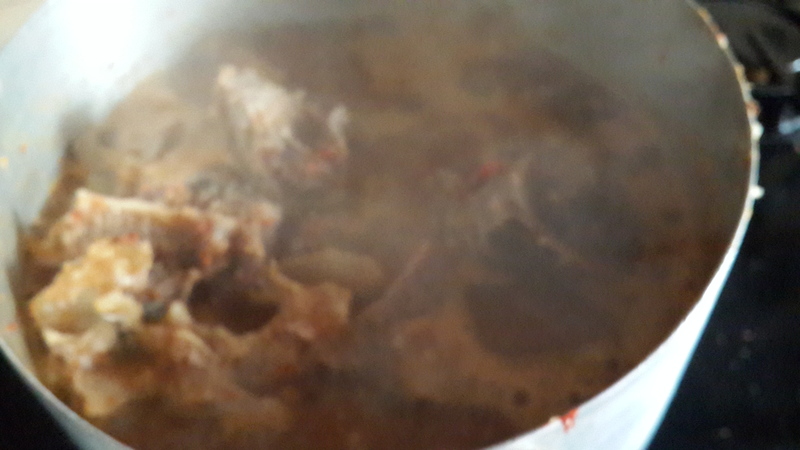 Now add your dissolved -dissolve with water- ogiri, and allow to cook for about 5 minutes now add the Uziza leaves and turn off heat after 3 mins. 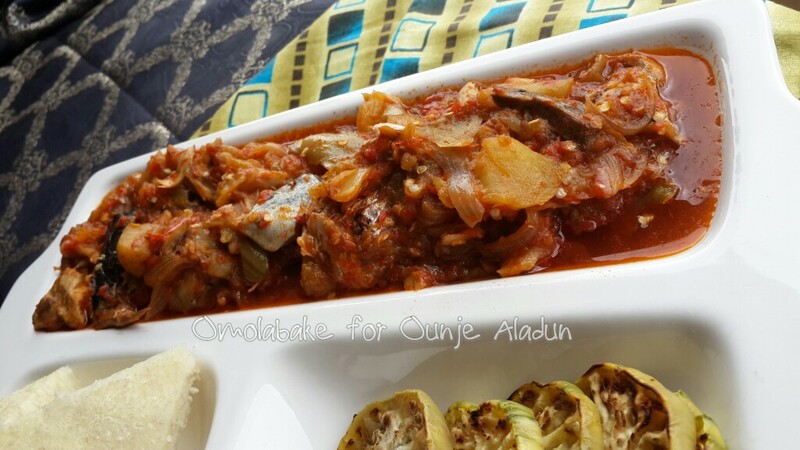 In another larger pot, cook the seafood starting with the fish, cooked with water, onions, seasoning cubes, salt, shredded stockfish, bonga fish. When the fish is almost done, add the Carbs and cook for 3 mins, then add the Prawns. 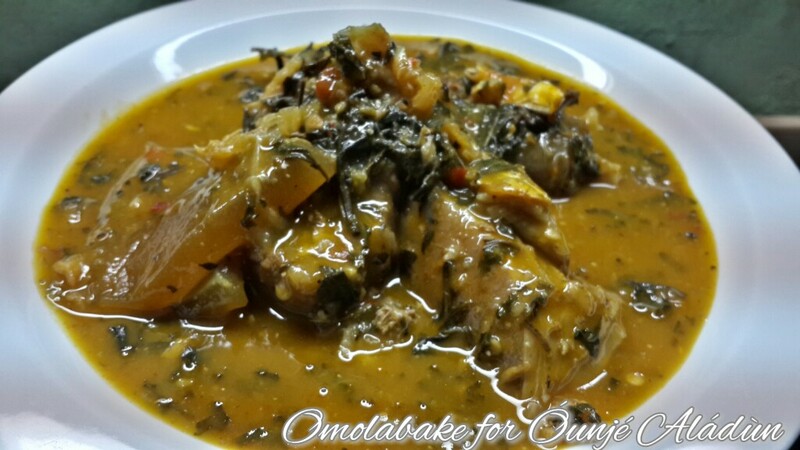 At this point pour cooked Ogbono into the pot of Seafood and shake it together to mix. 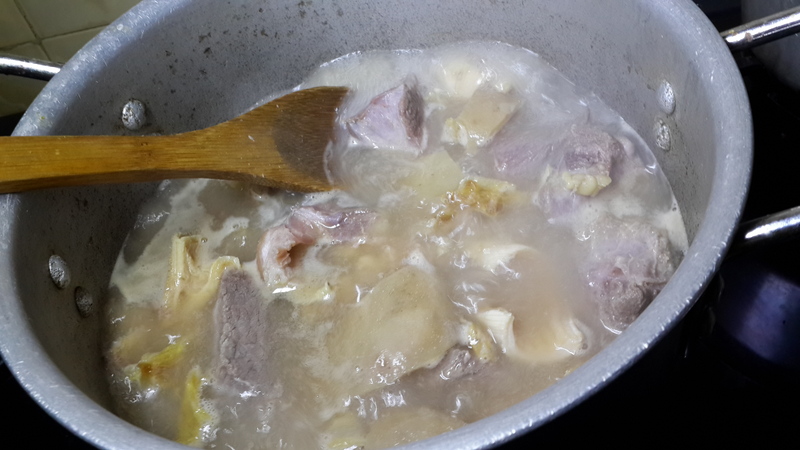 I stirred very carefully with a wooden ladle , cooked for 5 mins and lastly I added the periwinkle. Cooked for 1 1/2 mins and turned off the heat. 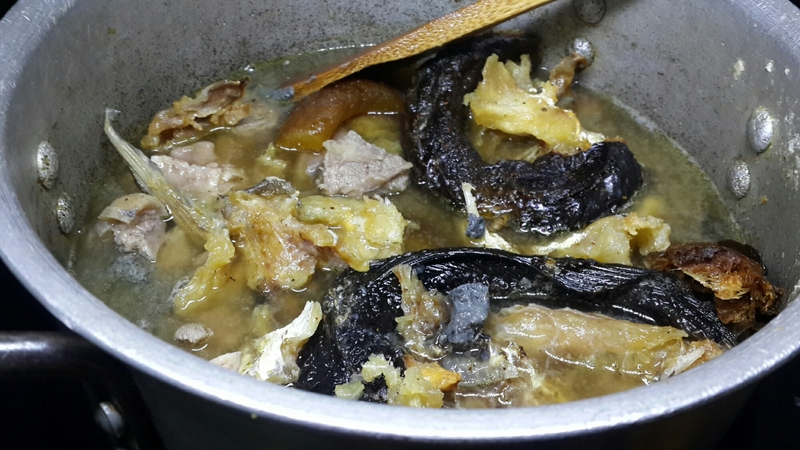 Black Soup is a rich herby soup with a delicate balance of aromatic flavours if well cooked. 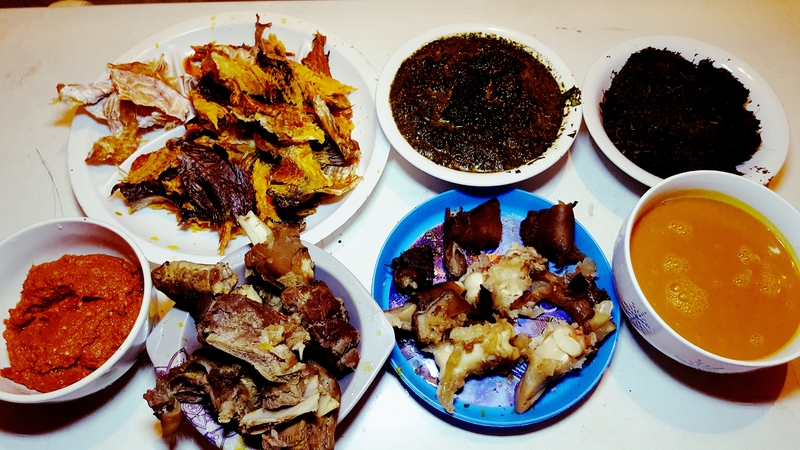 Basic Ingredients: (Back-Front, Left-Right) Smoked Eja Obokun (blue catfish), blended washed bitterleaf, blended Utazi and Efirin leaves, blended fresh pepper and dried crayfish, boiled meats of choice, palm nut cream. 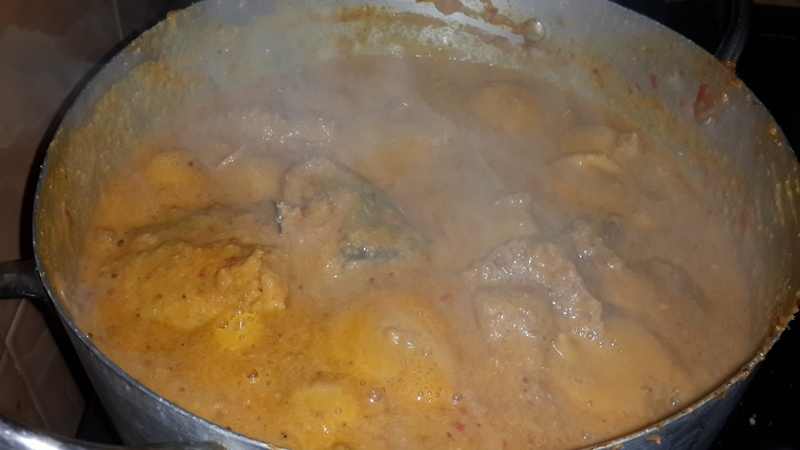 In a pot heat up your stock and add your cooked meats, bring it to a boil and add your palm nut cream and pepper mix. 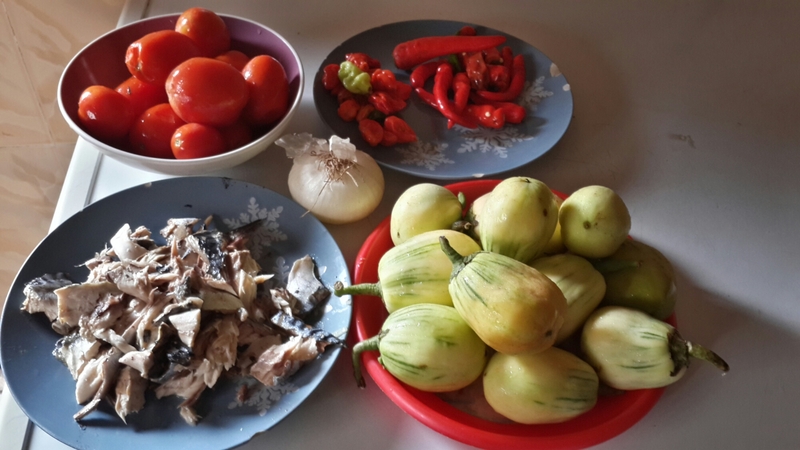 Cook for about 10 – 15 mins. 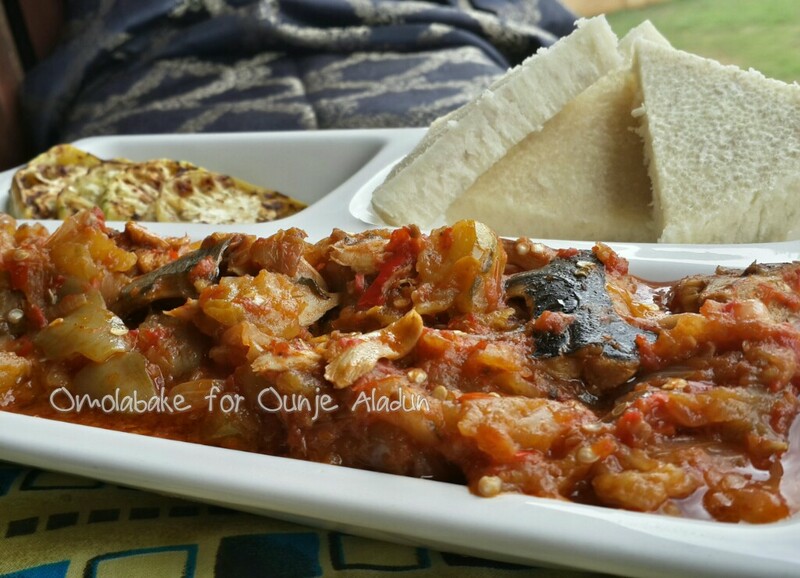 Add the smoked fish and cook. 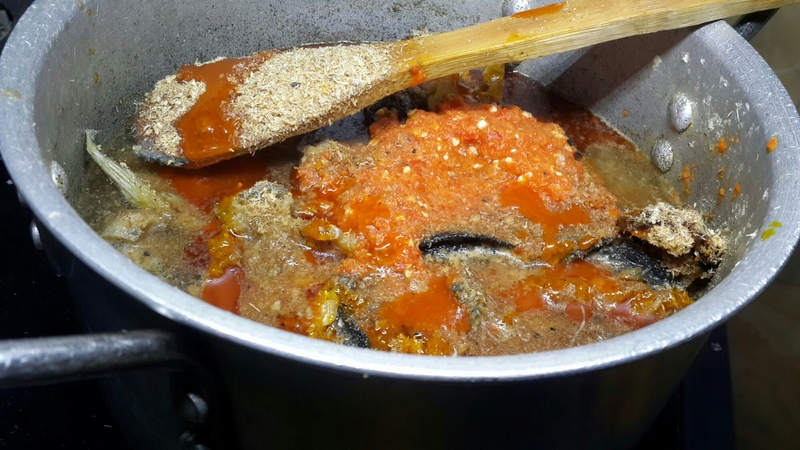 If you pre-soaked the smoked fish you may not cook longer than 3- 5mins, if it is not pre soaked cooked the fish in the soup for about 10mins. Add your blended vegetables to the broth on medium heat and cook. 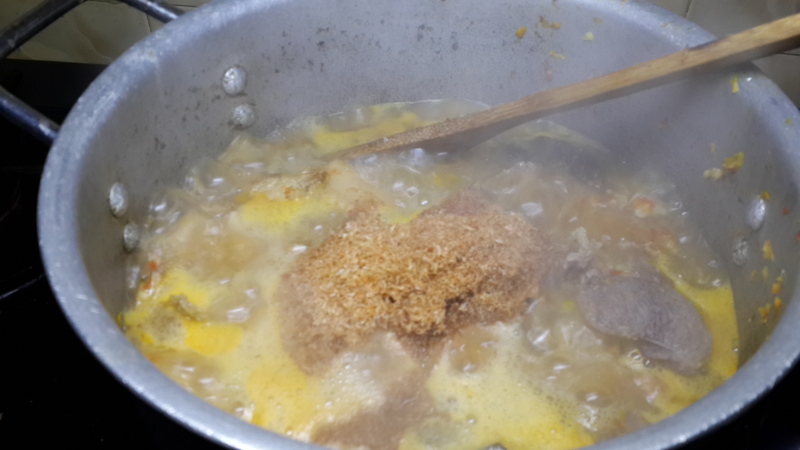 Cook with lid off and let the water reduce, be careful also not to over cook the vegetables. Personally I try not to cook vegetables longer than 5-7 minutes. I find the earthen ware gives it a very local appeal. 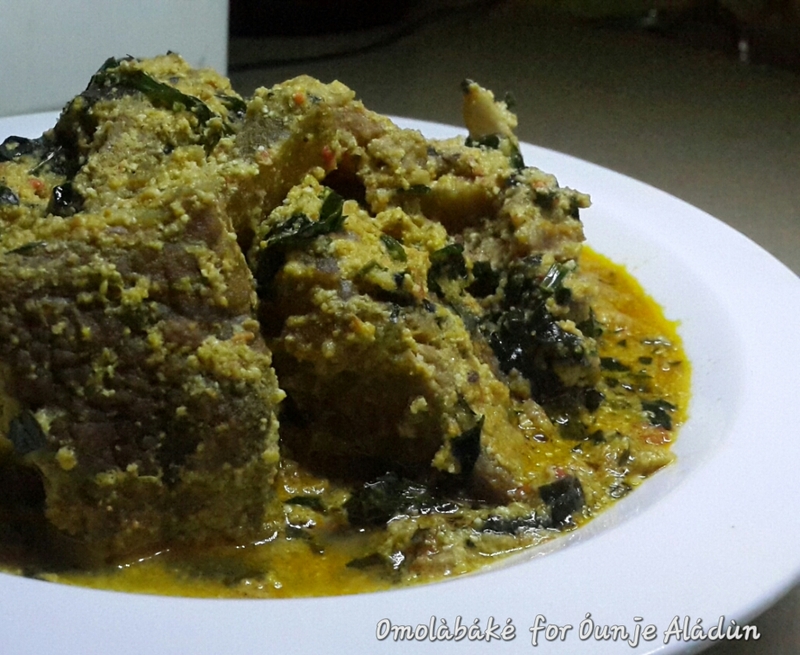 Egusi Soup; With a burst of flavours. A picture they say, says a thousands words, unfortunately it does not express the fragrance or taste. 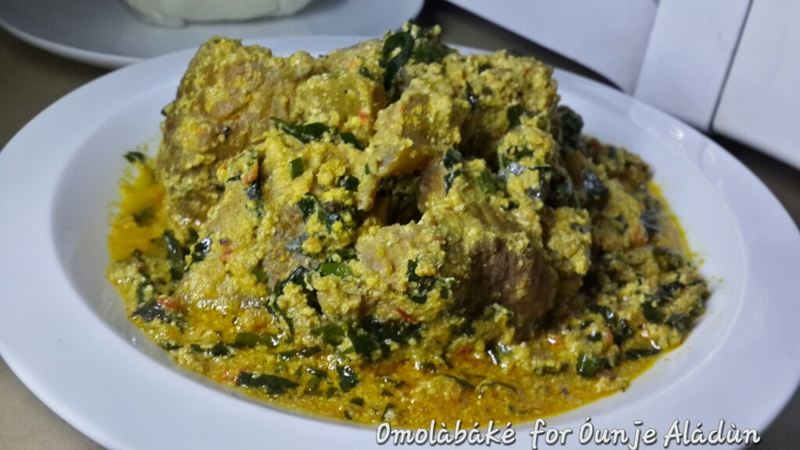 If it did, you’d know how I feel about this plate of Egusi Soup. It tastes and smells good to the last drop! I wish we explored our local spices and flavours a little more then we would give up the excessive salt and MSG we put in our food. 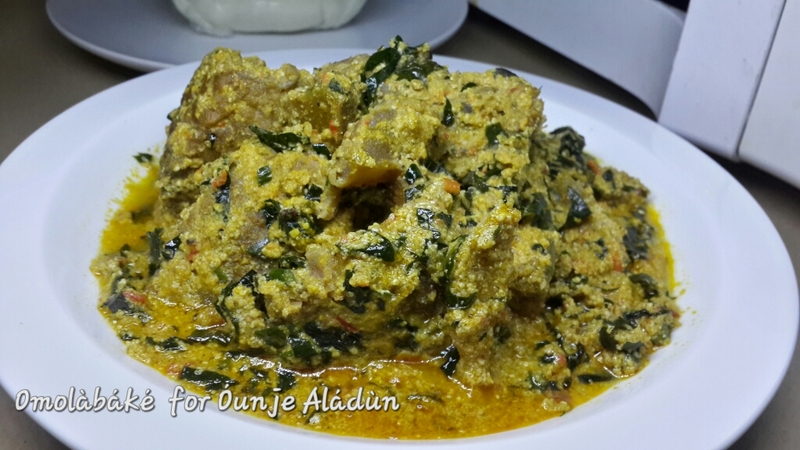 I made this Egusi without palm oil, however, I replaced palm oil with Palm nut cream, I used a generous about of Ehu ( Calabash Nutmeg), Ogiri and Uziza leaves. 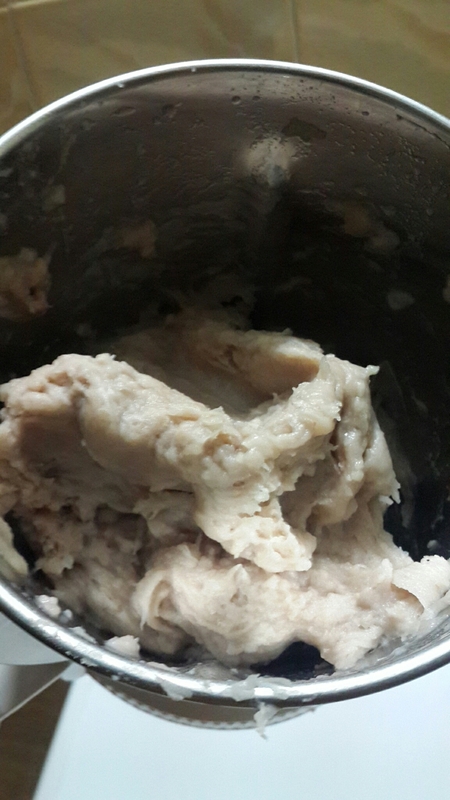 • 1 cup of concentrated Palm nut cream. 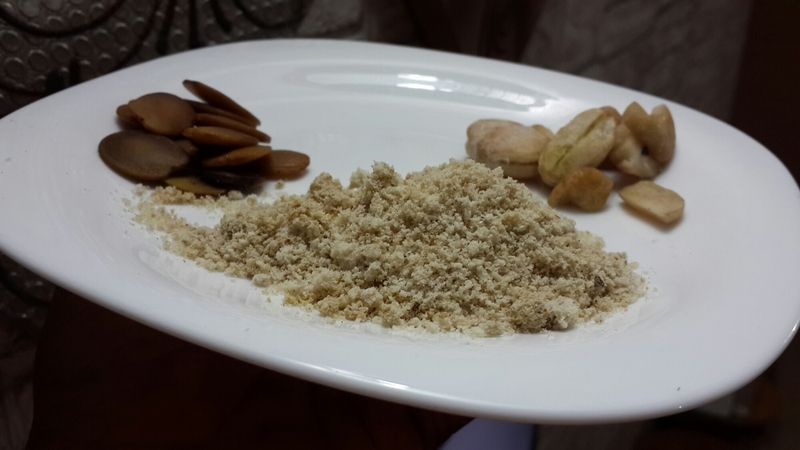 If you’d be making yours use about 500g of Palm nuts (Banga/Akwu). 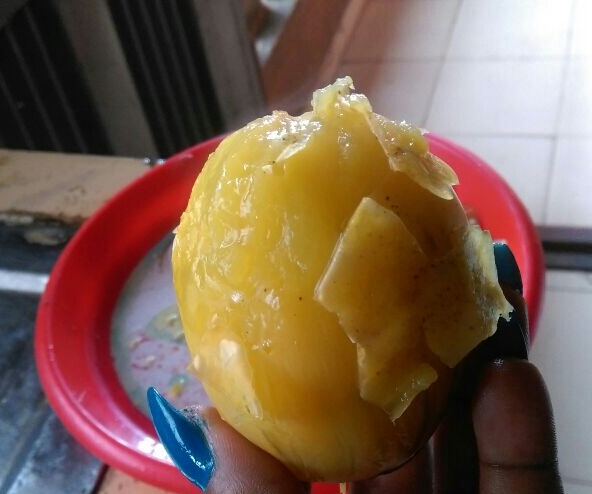 That should yield about 3 cups of palm nut extract. 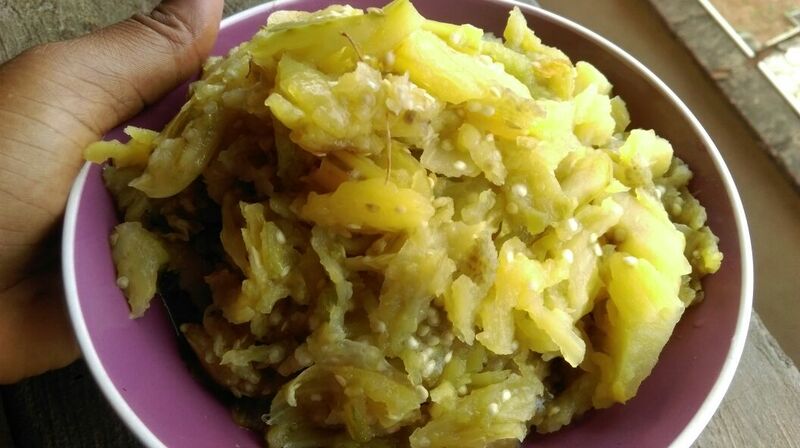 – Wash, season with salt and bouillon cubes your assorted meats, cook with onion till tender, add assorted fish if using any and add blended pepper, cook till the pepper doesn’t taste raw. 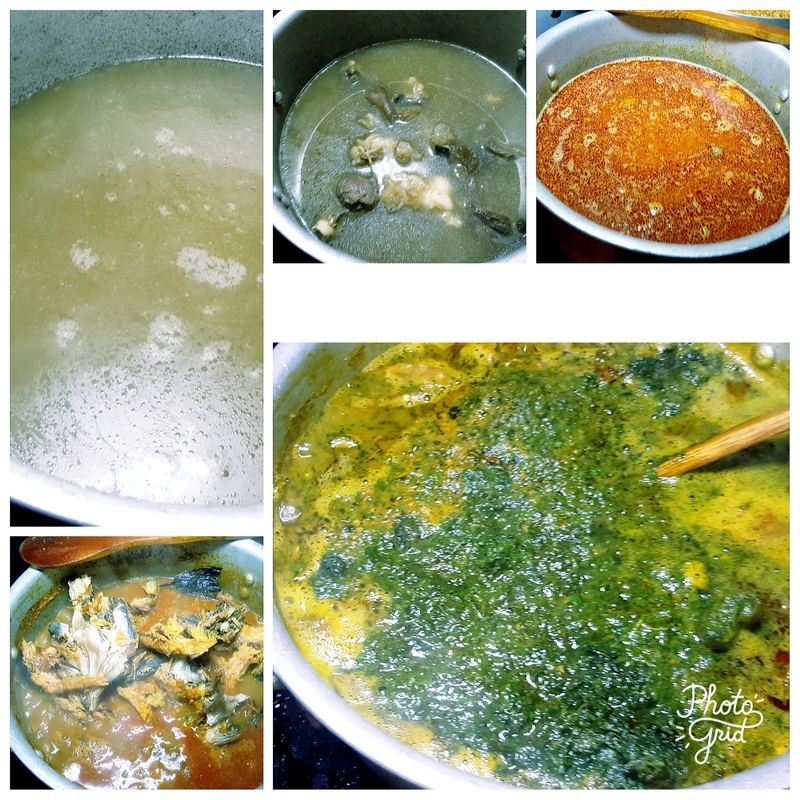 – Add blended Ehu and Ulima seeds, crayfish and Ogiri. Cook for an additional 10 minutes. 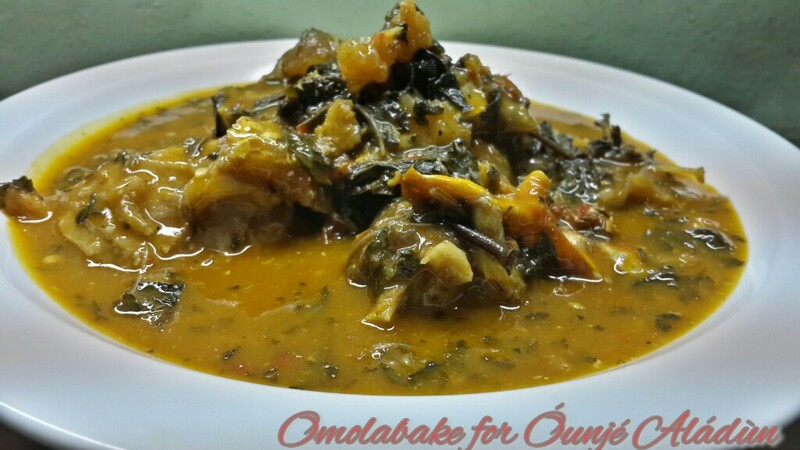 – Add your blended Egusi into the soup, it would soak up all the water. 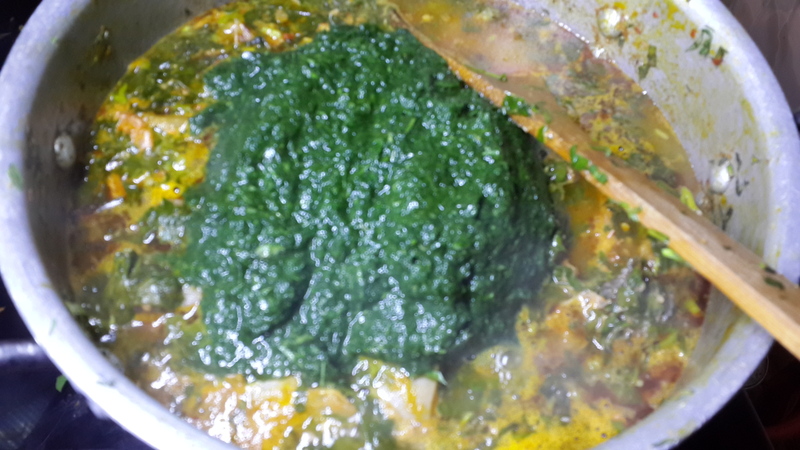 Dilute the palm nut concentrate if you are using the tinned type and add to the egusi in the pot. Stir till all is incorporated. At this point taste if it requires additional seasoning with salt or bouillon cubes. Adjust to your taste buds, do not over power. 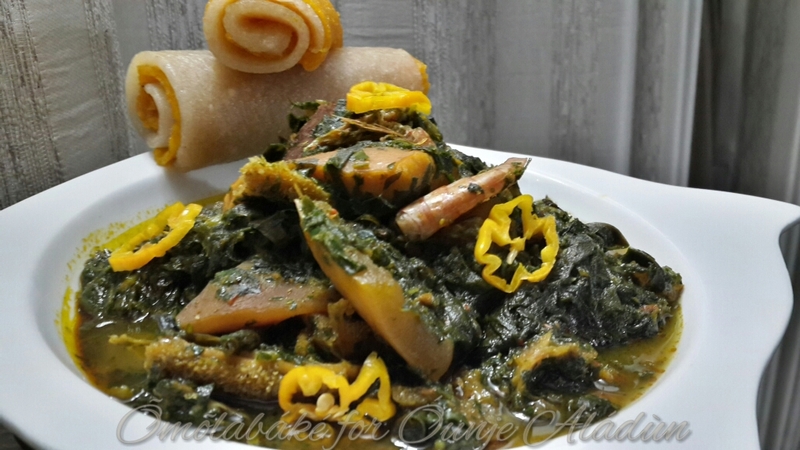 – Allow the egusi to cook for 10 mins, then stir in the two washed and shredded vegetables. 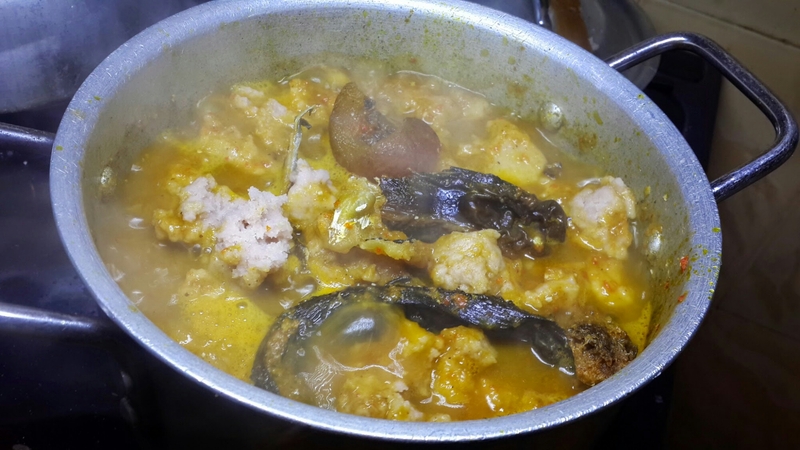 Once the vegetables have gone in cook only for an additional 5 minutes, with the lid off, so as not to over cook and to let excess water escape. The heat of the soup is enough to finish it off after that. 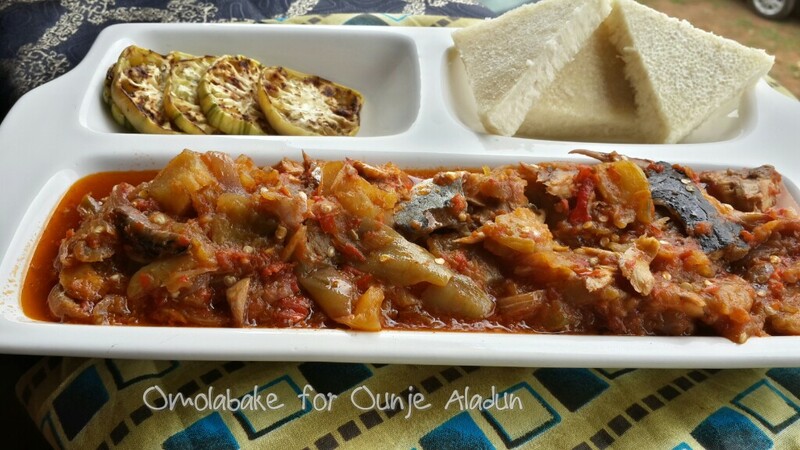 Serve with your choice of side dish. 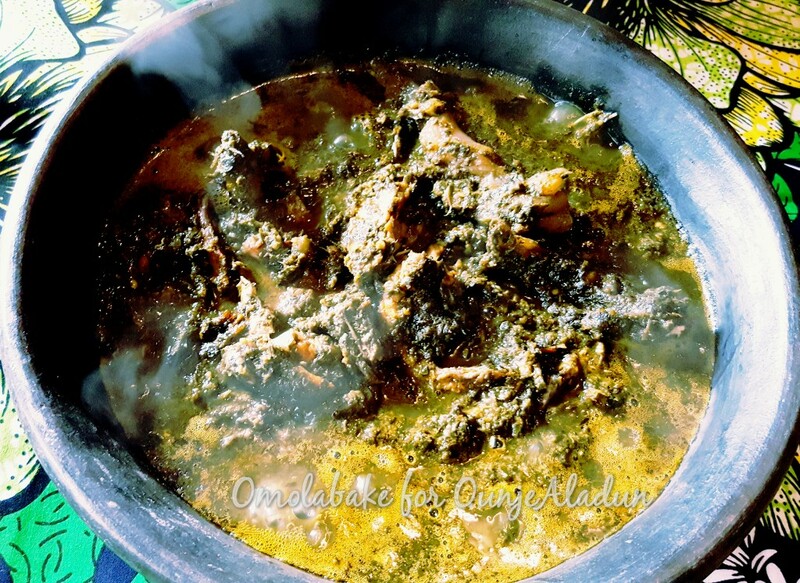 Anytime I see Afang Soup, it brings back fond memories of my first year in University. Brief story. I was allocated to Obafemi Awolowo Hall at the University of Ibadan, how I got there is a story for another. My roommates in F49 made my year really memorable. Unfortunately I have lost touch completely with all the ladies whom I know sadly by only their first names, I can’t recall the last names. 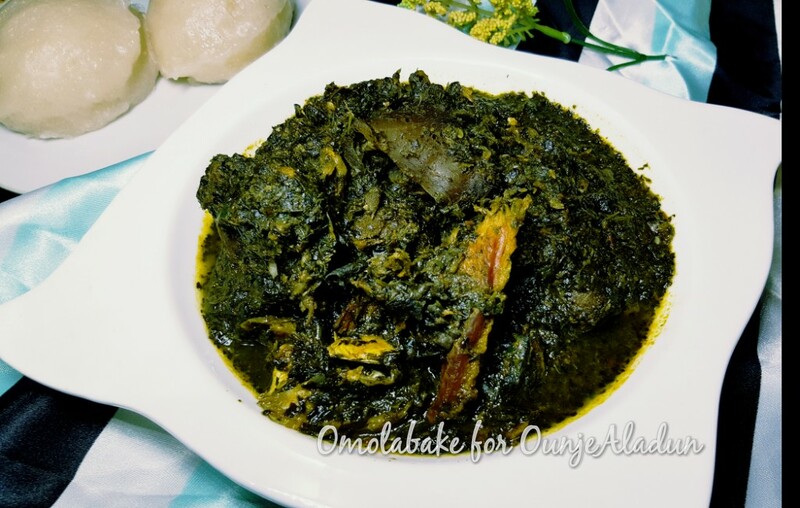 Chinasa, Olatunde and the hardly ever around Motunrayo. 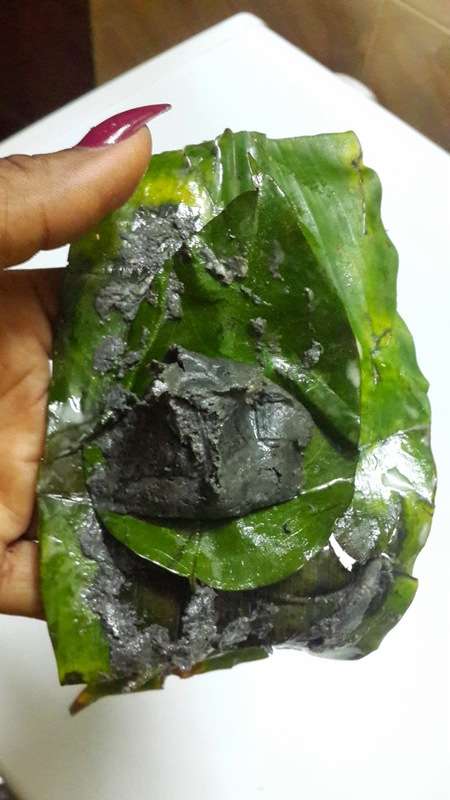 Anyway, Chinasa was engaged to wonderful Calabar man called Victor. He loved to cook and his soups were the truth. Each time he came to school to visit his woman , he never came empty handed, he also came with a pot or two. 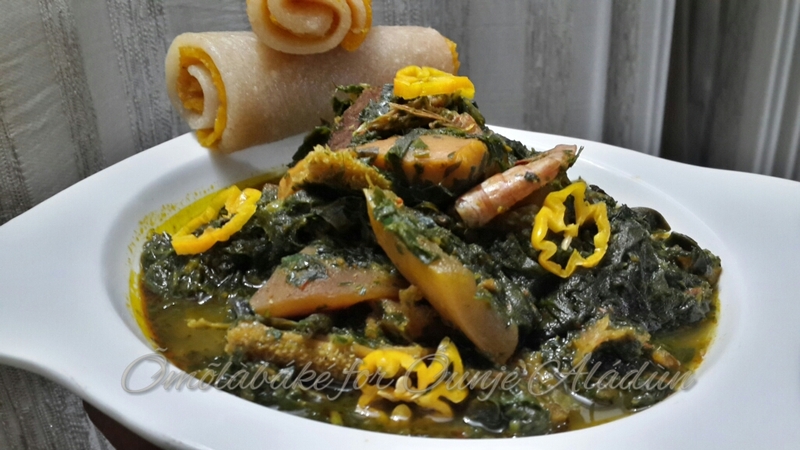 My first ever encounter with Afang soup was from Victor. 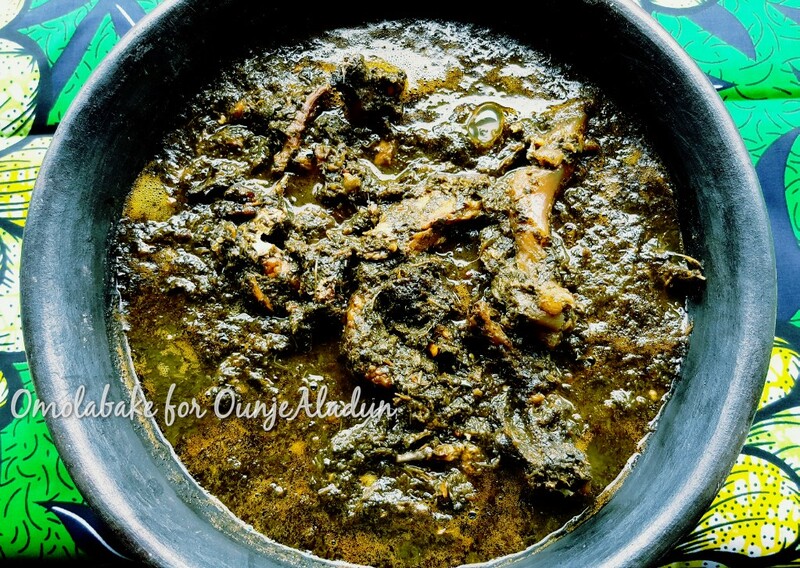 He brought his lady a pot of Afang one time she fell ill and the rest of us also descended on it like locust and devoured it. 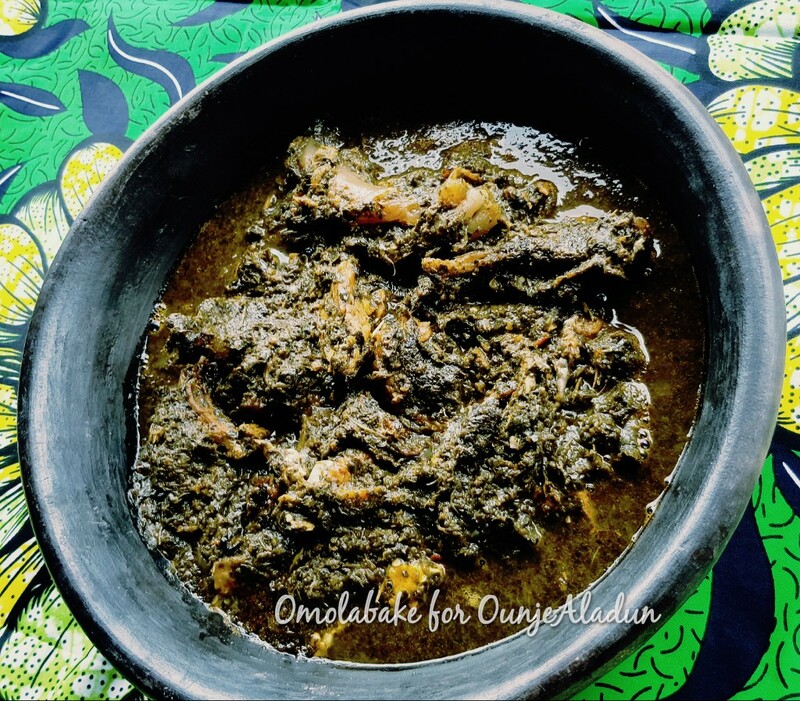 That was the day I fell in love with Afang! 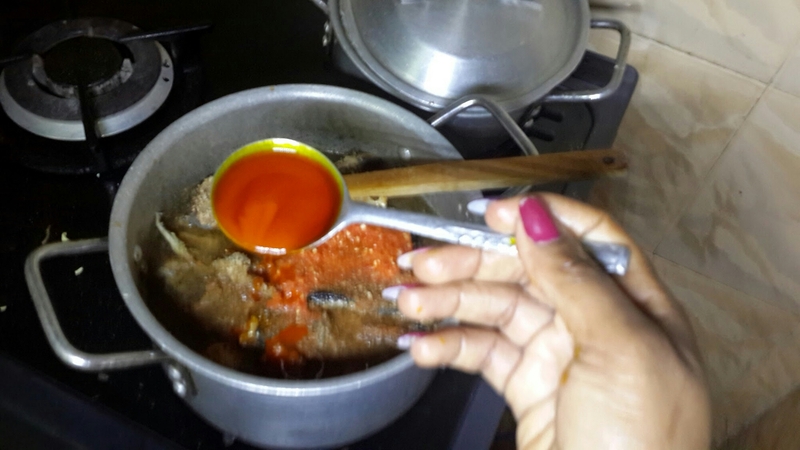 – Boil your meats with bouillon cubes and salt to taste. 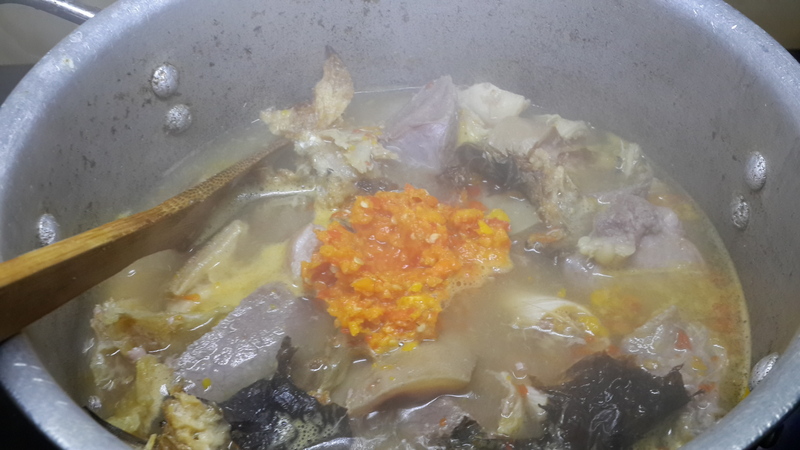 As the meat gets tender, add the smoked catfish, and stock fish. 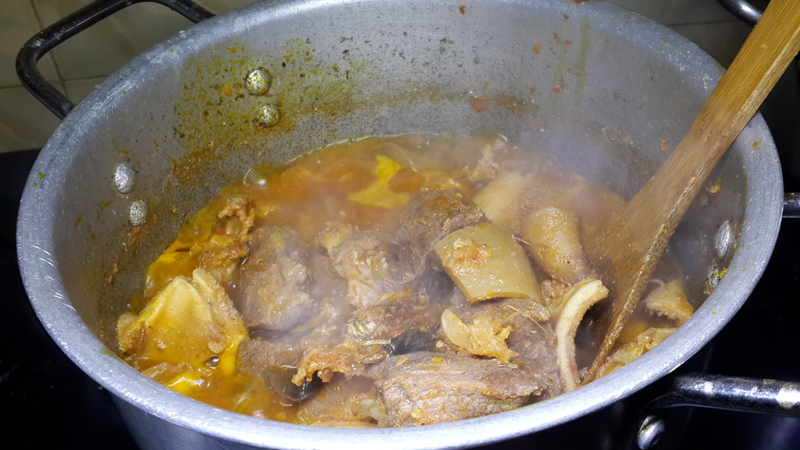 – While the meat cooks, pound or use a blender to blitz the shredded Okazi. 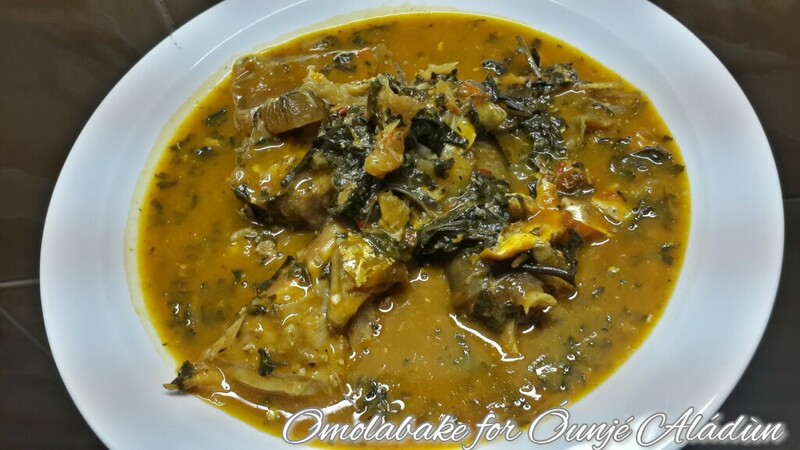 – Allow to cook for about 5 mins and add chopped water leaves. – Stir in the Okazi. 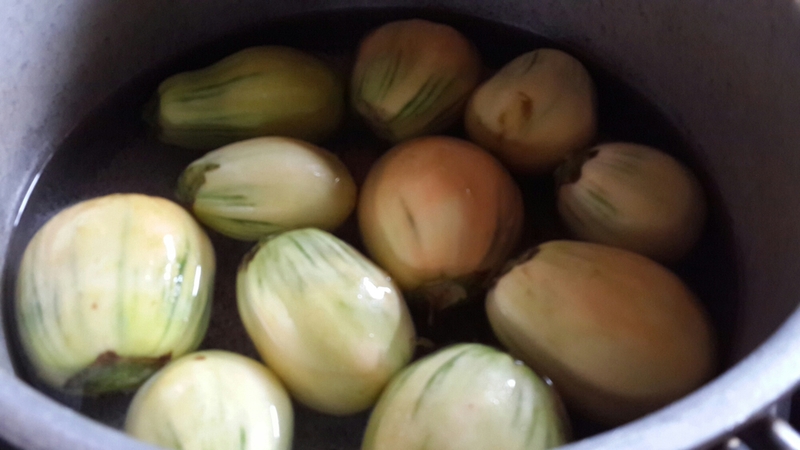 Once the Okazi goes in the water in the vegetable thickens a bit. 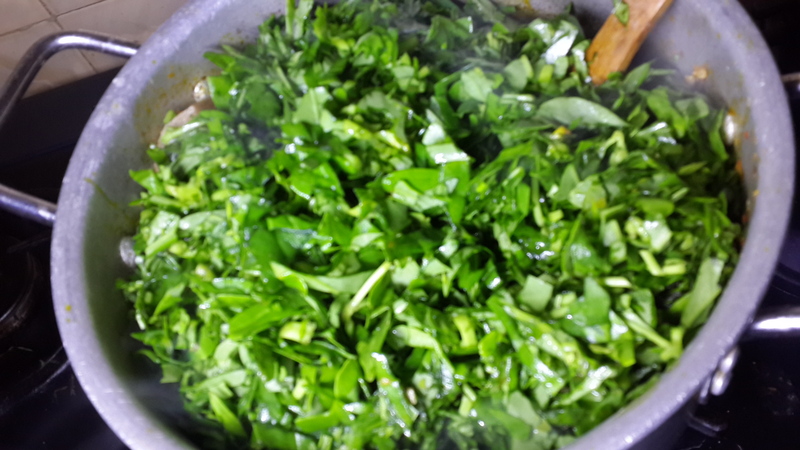 – To avoid having watery soup, boil your meats with little or no water, because waterleaf already has high water content. Enjoy with a starchy accompaniment. 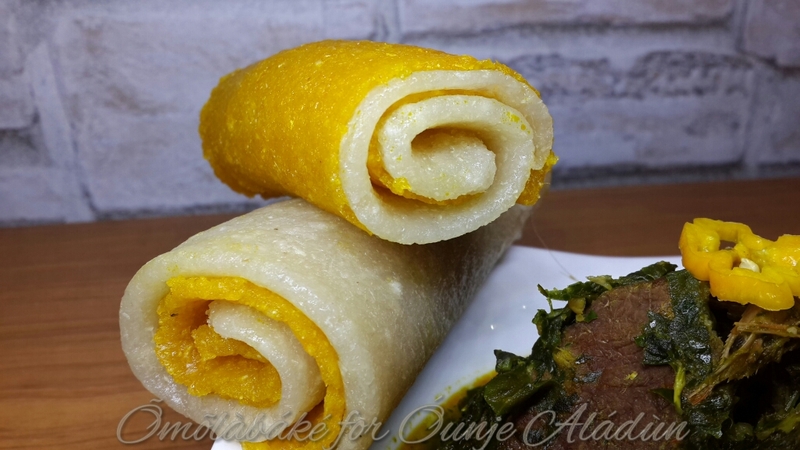 In this case 2 tone Eba.